Our recent economic meltdown transformed real estate from a popular investment to financial kryptonite. Too many people purchased homes with mortgages they simply could never afford. The good news: Great deals are out there for the taking. 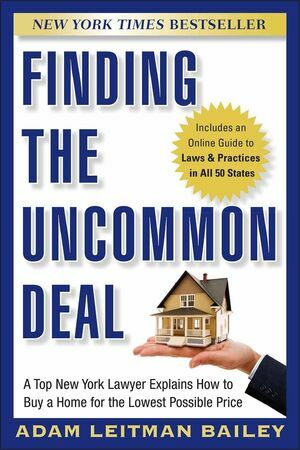 Finding the Uncommon Deal gives you the secrets to discovering and successfully negotiating the lowest prices for the most prized properties available. If you're successful enough to afford a home, then you probably have the skills needed to get a great deal in today's market. Finding the Uncommon Deal gives you the keys to leverage your skills for success and savings, opening the door to today's best properties and lowest prices. ADAM LEITMAN BAILEY, ESQ., has assisted thousands of property owners in buying homes. He owns one of the nation's most prominent real estate law firms as well as a real estate brokerage company and investment properties. The esteemed Chambers & Partners publication has selected him as one of New York's Leading Real Estate Lawyers and he was named a Super Lawyer by Law & Politics magazine.